Don’t you love fresh herbs? Now that I am growing my own, I try to use them as often as I can and fresh basil shines in this recipe! 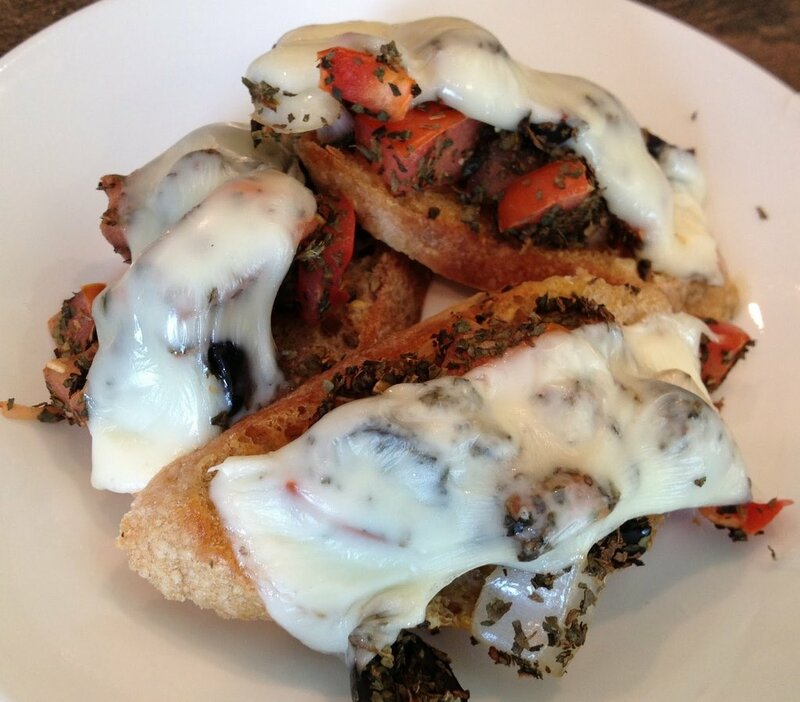 Be sure to use a large beefsteak tomato for this recipe. It just won’t turn out the same with another, smaller variety! The song “Let’s Call the Whole Thing Off” (this version sung by Mel Torme) recounts a couple quarreling about the different ways they pronounce words, including “tomato” verses “tomahto.” Regardless of how you say tomato, the recipe comes out great every time! Line jelly roll baking sheet with aluminum foil. Spray with cooking spray. 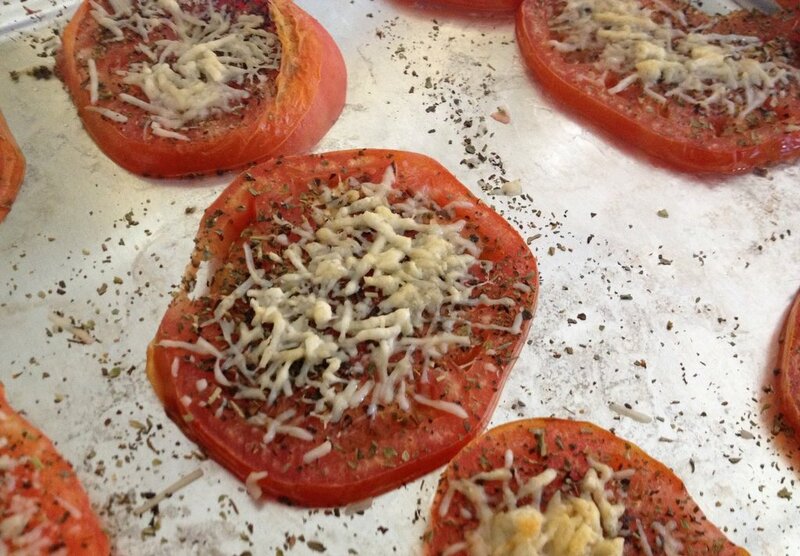 Place tomato slices on foil. Drizzle olive oil over each slice, spreading oil to edges with the back of a spoon. Sprinkle salt over each slice. Sprinkle 3 tablespoons Parmesan spread over all the slices. Crisscross slices of mozzarella over each slice. 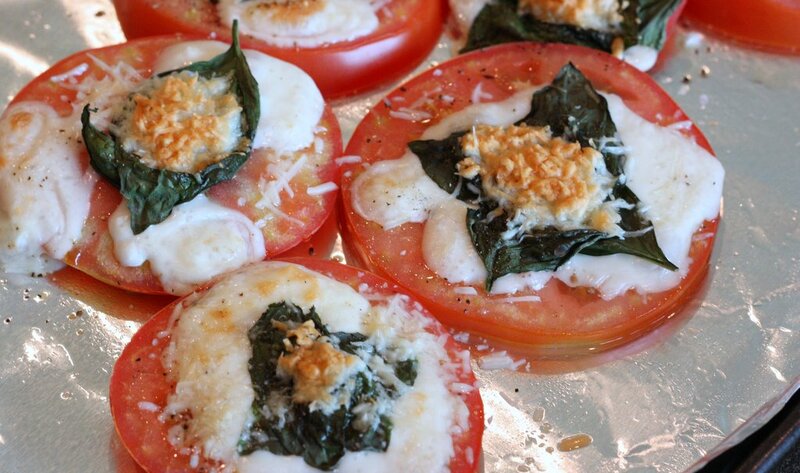 Lay 4-5 basil leaves over the mozzarella. Grind fresh black pepper over basil. Sprinkle remaining 6 tablespoons Parmesan cheese on top. Broil for 3-4 minutes or until Parmesan cheese is golden and slightly melted together.